11 As long as Moses held up his hands, the Israelites were winning, but whenever he lowered his hands, the Amalekites were winning. 12 When Moses’ hands grew tired, they took a stone and put it under him and he sat on it. Aaron and Hur held his hands up – one on one side, one on the other – so that his hands remained steady till sunset. 13 So Joshua overcame the Amalekite army with the sword. It’s tiring being the eldest child. It’s tiring being the parents! No matter how many children we have, we are all tired sometimes. Not everyone has a ‘village’ behind them, or surrounding them. One of the criticisms or painful recollections I read or hear about large families, is that too much is expected of the older children, they are expected to ‘parent’ the younger ones, and that they were not allowed to just be children. There’s a lot in this to break down, and discussing children and chores is definitely on the menu! But how about the pressures on our eldest children to be leaders, set an example, always do better so that the younger ones can follow? My husband and I are both eldest children. We have also taken a different road from each of our families of origin. We are in that place where we will either be tempted to overload the eldests (because in a family of 8 the dynamic of who is the eldest is a flexible one)…. Or we will be accused of it. Probably already have been. We see leadership qualities in all of our children. Our mission statement as a family includes what we see as a call to raise the leaders of the next generation. Leaders wherever they are, whatever they are doing, and whether they are assertive and ‘out there’ or quiet, gentle leaders. Moses was a leader who grew tired. We had read the story in a morning devotion on a day we were struggling. My eldest was struggling in particular. A late night, stresses that were upsetting him… I realised that even leaders need their arms holding up now and again. That includes us as parents, and it includes all of our children, even the eldests! I explained to my son the significance and the meaning of the Aaron, Moses and Hur story to me that day. I assured him that it was ok that he needed his arms to be held up. We are a team. We can each hold up one another’s arms when we are weary and need help. It’s ok to be tired. It’s ok to need help to do something that we can normally do, or that is within our control or power. 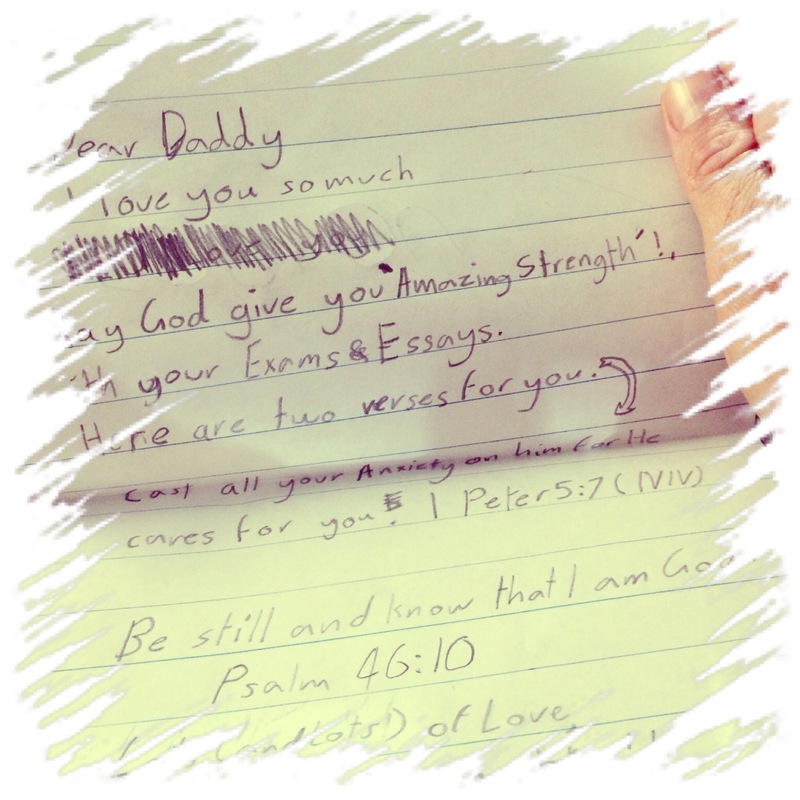 Yesterday that same eldest child stepped up to his leadership qualities and held up his Daddy’s arms with the gift of a beautiful letter of encouragement and scriptures. The leader of our household needed, and had his arms held up by his eldest son, his wife, and other of his children. In fact all of the children contributed silently and without needing to be asked, in different ways. Maybe just taking the pressure off, amusing themselves, playing quietly and allowing their Daddy to study. Today: eldest needs holding up and that’s ok. We are a team. There are even more of us to support each other. We can go with the natural ebb and flow of energy and stress levels and emotional capacity. We all need our arms to be held up sometimes. Next > Less is more. A decluttering story.